Answer- I was traveling through Europe in the Summer of ’99 and stayed with a lovely family in Solothurn Switzerland. At the time I did not have a taste for wine, however, the first question my host father asked me upon my arrival was ‘Do you like wine?” He showed me his 5000 bottle cellar, pulled four different bottles for us to try that night and changed my life forever! I think the most important trait is the ability to listen. Being a sommelier is not just pouring the wines that you love and forcing guests to drink them because you think they are cool, it is about finding out what the guest wants and helping to make their experience at the restaurant extraordinary. I had a general manager back in Minnesota named Jeff Dolan. He was not a sommelier, but he had amazing wine knowledge and it was his ability to listen to the guest without ego or agenda that made an impression on me. I have found my jobs on the guildsomm site, Craigslist and on industry message boards and email chains. It is important to connect with others in the industry because they are normally the ones that know bout positions before anyone else does. Also, have a clear vision of how you want your career to move forward. Some cities have better communities for wine professionals than others, that can be a determining factor as well. A good professional should know the menu forwards, backwards and upside-down, you should ascertain what they quests wishes are. Did a bottle catch your eye? Would you like a recommendation? If they put it in your hands I ask a series of short questions to hone in on a specific pairing. Red or white, full or lighter bodied, earthy or fruity? Once you have these answers and know what they are intending to order for dinner, you should be able to come up with a few options to recommend. I generally start with a mid priced bottle that I love and watch their reaction. If they seem agreeable, I may show them something a little more pricy as well to see if I can get an up sell. If they seem uneasy with the recommendation it often has to do with price, I then offer another amazing wine at a lower rate. There are also times when you know a specific wine is the best pairing. Whether expensive or not, I like to tell them this is my favorite with this dish or dishes. First- Drink what you like. After that, match intensity of flavor. If you have an intense dish, you need to pair an intense wine with it and vice versa. If you get past that then I move onto complimenting and contrasting flavors. Acid with acid, tannin with fat, matching herbal notes, matching spice qualities, salty or spicy with sweet. There are so many ways to go. However, long gone are the days of white with chicken and fish and red with all meats. Pricing is a decision that has to be made in concert with the financial people in the restaurant. Each restaurant has different goals and different financial needs, pricing should be based on meeting these goals. A restaurant like Landmark in NYC does not have wines by the glass, they only have half bottles to offer. As a result, they do not have the loss that comes with pouring wine by the glass and can then pass that extra savings on to the guest. Their philosophy is that the lower price with entice guests to purchase more wine, and it works for them. Other restaurants have much higher mark ups, but they know this will work in their venue with their ambiance and the clientele. You have to know your guests, know your location and use pricing to meet the specific goals of your restaurant. The best ‘soft’ approach I had was a guest who came to dinner with his family and brought a bottle with him. We offered corkage service and the gentleman offered me a taste of the wine. When he noticed my positive reaction to it he mentioned that it was his and then told me a little about it. I had it on the list the next week. I loved the wine, the story and the soft sales technique. I like aspects of the different tools that I use. 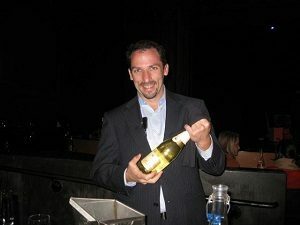 I am on guildsomm frequently, I use BBR.com because I like their vintage section.